The United States Postal Service (USPS) released their 3rd Quarter 2017 Financials last week, and as expected, the news wasn’t good. While the USPS continues to reduce expenses – down 2.4% – they weren’t able to generate enough income due to slumping mail volumes, resulting in a “controllable loss” of $587 million. The USPS uses the term “controllable loss” to indicate their financial status excluding the mandate to prepay future retiree health benefits under the Postal Accountability and Enhancement Act of 2006. These controversial payments haven’t been made for years, but are still carried on the books. Uninformed reporters and critics of the USPS always include these missed payments in their articles and blogs. The rate of decline of First-Class Mail volumes increased over previous years – up over 4.8%. Marketing Mail (formerly Standard Mail) also declined by 3.5% over the same period in 2016. However, it’s important to remember that 2016 was an election year, and that there was a 1.7% bump in Standard Mail volumes over 2015. Given the current state of politics, it’s not unreasonable to predict a similar bump for the 2018 elections. 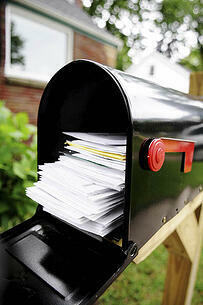 The subject of politics leads to Postal Reform – which is heading nowhere. In a previous blog post, we pointed out the dim prospects of H.R. 756 – the “Postal Reform Act of 2017.” In March, the House Oversight and Government Reform Committee unanimously reported out the bill, with support from Republicans and Democrats. However, nothing else has happened. Because this bill involves Medicare, it was also referred to the Subcommittees on Health of both the House Energy and Commerce Committee and the House Ways and Means Committee. Neither of these subcommittees have scheduled a hearing on the bill. And there’s no comparable bill in the Senate. In the past, we’ve criticized the Senate for not holding votes on nominees for the USPS Board of Governors. However, that isn’t the case this year. There still haven’t been any hearings or votes on nominations, but that’s not the fault of the Senate. It’s because President Trump hasn’t nominated anyone to the 9 open positions. That means the Board of Governors will continue to operate under the authority delegated to the Temporary Emergency Committee (TEC), which now includes only the Postmaster General and the Deputy Postmaster General. Absent a significant event, it’s unlikely that either the House or the Senate will move forward with Postal Reform. Despite optimistic pronouncements from USPS leadership, the empty seats on the Board of Governors won’t be filled soon. The most probable way forward is through the Postal Regulatory Commission (PRC). In the next few months, the PRC will release it’s review on the postage rate-setting process. Under the existing rules, the USPS can’t raise the rates on First-Class Mail and Marketing Mail (market dominant products) above the rate of inflation as determined by the Consumer Price Index (CPI). The price cap was a bad idea in 2006, remains a bad idea in 2017, and should be ended by the PRC. Many people are optimistic that the PRC will lift the cap, but that’s still an uncertainty. Meanwhile the mail must continue to get delivered. Fortunately for the American public, neither declining revenues nor absent governors nor lack of postal reform will keep the USPS from making their appointed rounds.